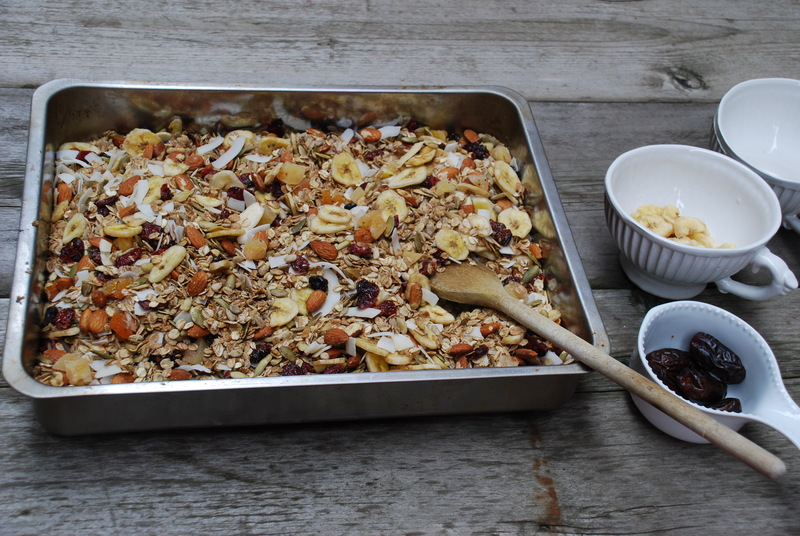 Having tried my lovely sister in law Hilary’s amazing home made granola while on vacation a couple of years ago, I realized I could not compare the taste to any other granola I had tried before. I loved the fact that you could add whatever nuts and fruits that appeal to you in whatever combination you choose, rather than the generic combinations out of a box. Dates, pistachios, orange flavored cranberries, dark chocolate chips, anything you like! Also it just tasted healthier and felt like it was better for you. 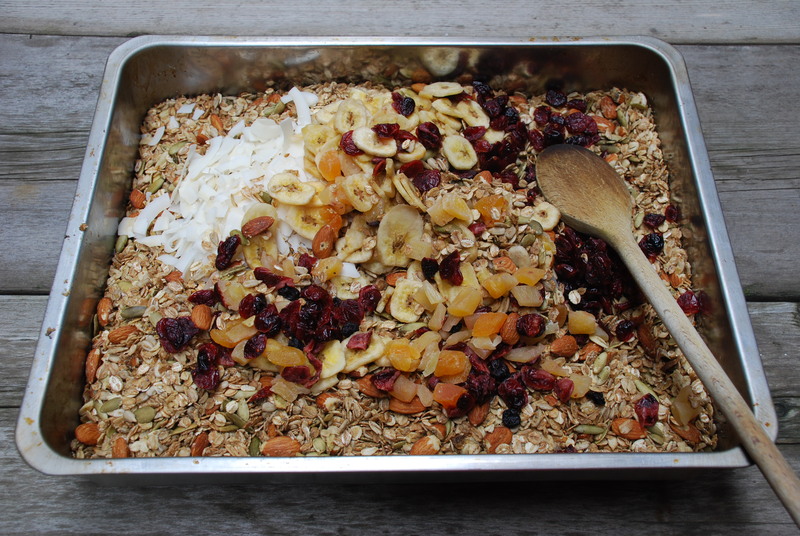 Still it took me more than a year to finally try and make granola at home. The thought of going to the health food store and collecting all the many ingredients I imagined would be needed on a frequent basis put me off. Anyhow, on one trip to Trader Joe’s while walking through the cereal and health section I realized most of the stuff I needed was right there under one roof and I could get it on my weekly shops rather than having to go to special stores on a mission to collect things. 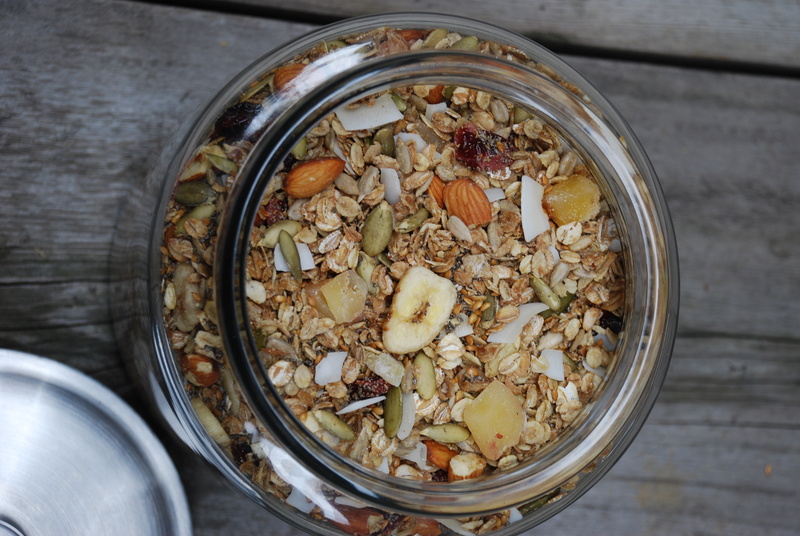 I began my research for the best granola recipe on the internet looking at many. I ended up coming up with my own using ingredients I thought were healthy and wanted to incorporate in my diet. Hence, the addition of chia seeds and flax seeds. I sometimes even add wheatgerm to the mix before roasting. I decided to go with a mix of grains rather than just oats, as I thought a variety would be better not only for texture and flavor but also from a nutrition perspective. You can use oats alone if you prefer. presence of a true domestic Goddess or God! And it really does not take more than 10 minutes of measuring and mixing after you have made it the first time. Then its just a matter of mixing it around a bit with a wooden spoon every ten minutes or so while it bakes. 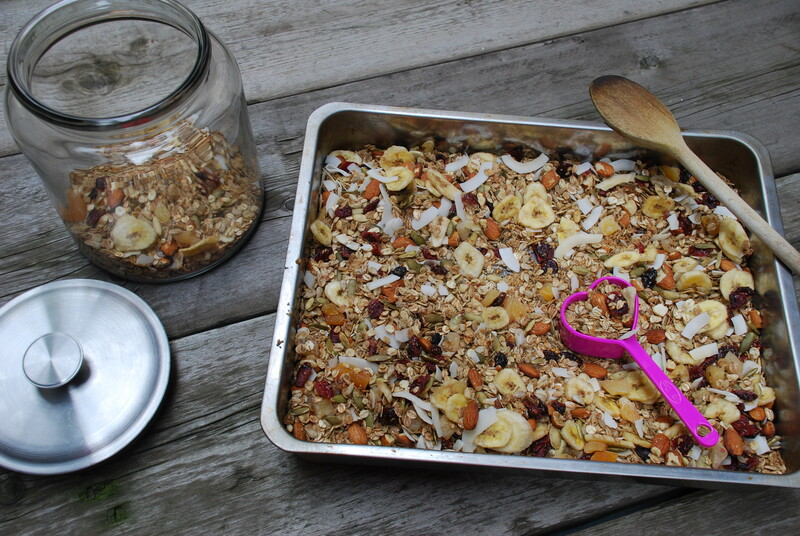 I now look forward to my scrumptious bowl of granola every morning, and I am the kind of person who really is not too keen on breakfast first thing in the morning! I would usually not have anything for hours other than multiple cups of earl grey tea! This granola is also really yummy with some quality Greek yogurt and a drizzle of honey on top. So thanks to Hilary for sowing the seed and inspiring me to ever attempt this at home. This Granola for the Gods must be made at least once so you can see how it makes your mornings so much more joyful! But be warned, you then won’t be able to eat the stuff out of the box ever again! If your coconut oil is solid, place the coconut oil, maple syrup and vanilla extract in a bowl and zap in the microwave for 20-30 seconds and then whisk together. If the oil is in liquid form no need to microwave, simply whisk with a fork till combined nicely. 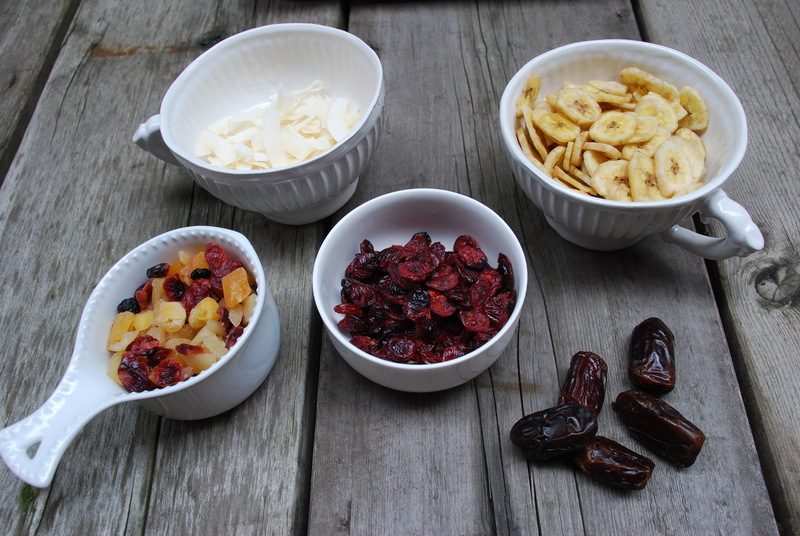 Mix all your dry ingredients other than the coconut chips and dried fruit in a large mixing bowl. Add the oil and maple syrup mixture to the dry ingredients in the bowl and mix well. Pour the mixture into a large roasting tin, spread evenly and place in the oven. Bake for forty minutes, give it a mix with a wooden spoon 3 or 4 times along the way so it roasts evenly. 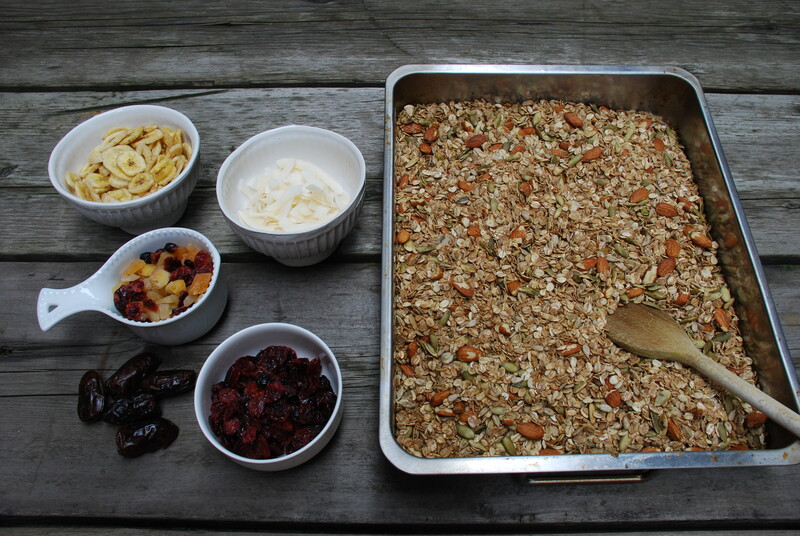 Once the baking time is up take out of oven and cool the granola. Once it is completely cool add the remaining dry fruits and the coconut chips. Store in an airtight container and watch it vanish before your eyes! Awesome! Gotta try this out! Thanks Gilu! Do let me know how it turns out! 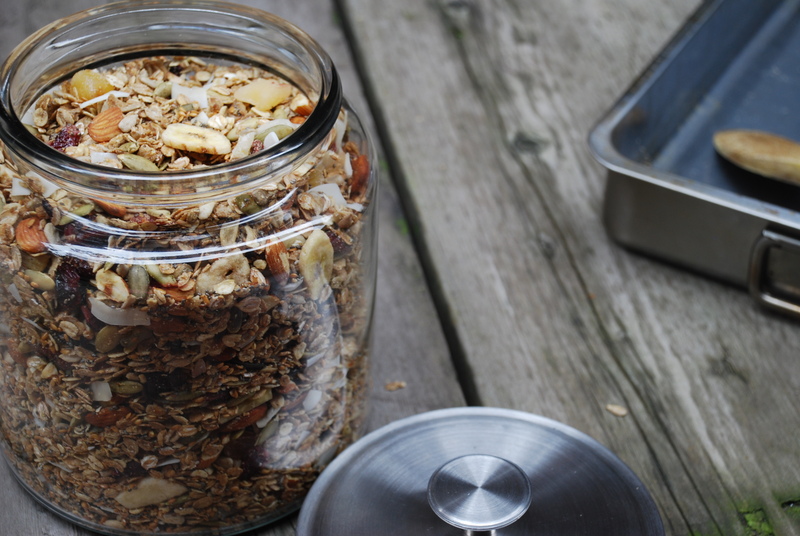 The best recipe for making granola yummy and healthy. Easy to make. I will defiantly try it soon Deepali. The best part is you can add what you like according to your taste.